I am wishing all of you a wonderful start to 2012 and pray that the year gives us pleasant times and many, many reasons to smile and feel on top of the world each day of the year. Personally, it is not just the beginning of a new year for me. It is replete with beautiful memories. It is Saira’s mother Naseem Banuji’s (Appaji) birthday and my thoughts turn to her and the way she made a difference to our lives. My thoughts turn right now to Appaji and the quiet, unobtrusive way she made sure I was living the life that even a king would have envied. She was the epitome of beauty, grace and refinement and it reflected in her speech and manners. Appaji always made January 1 special not for herself but for all of us by giving us a lovely day with some gorgeous surprises. Appaji, brought me and Saira together in marriage in 1966. She taught Saira to be the caring, unselfish and understanding wife she is and I would credit it to Appaji that Saira evolved over the years into a strong, gracious woman with the will to bring my own family closer to me. Saira and I have accepted the will of God and learned to live without her but not a day passes without our thoughts recapturing her contribution to the strength of our marriage and love for each other. Wish you a very Happy New Year full of good health and happines. A Very Happy and Healthy New year to you Sir. Not a day goes by when i do not check for your new post and tweets. I remember, once , I was @ a famous Opera House store & Naseemji was shopping too & she looked serene & lovely . What a graceful & True Beauty. Dilip sahab, you are still ruling our hearts till today. May God give you good health always. Best to Sairaji too. May Appaji RIP. Epy New Year 2012. I wish both of u a very Happy & Healthy year ahead. May the New Year bring you and family more joys, rich fulfillments and extremely good health! Aapko bhi Nav Varsh ki hardick shubhkamnayein. My Dear Sir! Its so nice and great to hear about Late Madame Naseem Bano from you. Your opinion about her has a great value being her son in law and having spent so many years with her. 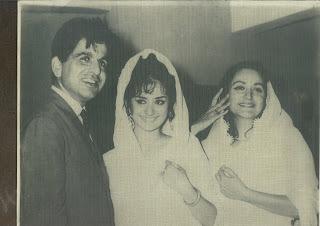 I presume you both knew each other from Filmistan years that is around 1948. You must have great memories of the Diva, waiting to read it all in your autobiography. I remember Naseem Bano g from Pukar. I loved the way she sand second variation of the line Zindagi ka saaz bhi kya saaz hai. She was a great beauty. Also i was amazed that Naushad saheb got her to sing Mir's ghazal "Ye dhuan sa kahan se uthta hai" in a background score of Kamal Amrohvi's Pakeeza! 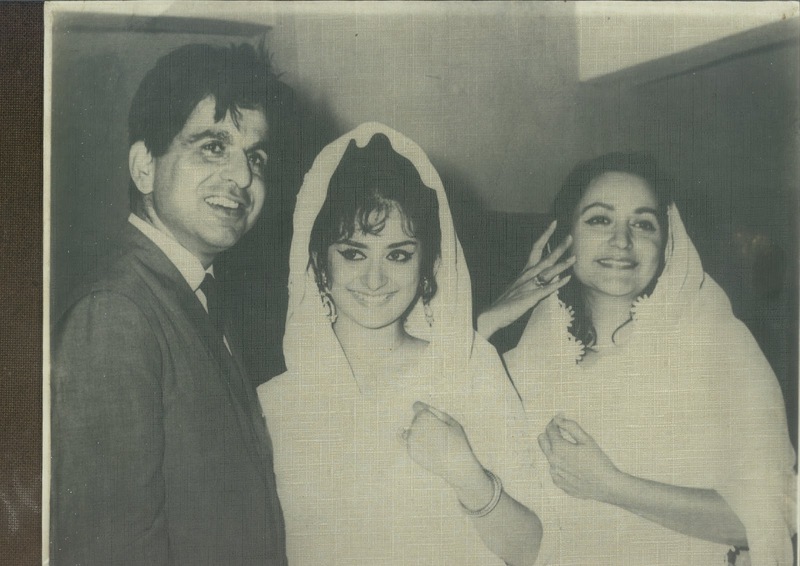 And of course seen her name many times in the credit titles of Saira g's films as dress designer of Saira Bano. Wish both of you a happy & healthy new year. In one of the above comments somebody wished you to write something daily and we, your fans, can react to it. Its a great idea. I am 62 and enjoyed each and every film from 50s to 70s. I shall request you to write something on your each and every film daily and you read our comments which I hope will be a great entertaining for you. You entertained us till now and its high time you give us a chance to do so. Thanks & Regargds. Salam Dadaa.. Wish you a very Happy and Prosperous New Year.. Happy new year to you and your family .sir as i always request you please write your blog daily many stories related to you are behind the curtain.but first of all your health ,so take care ,always in my heart,. Dear Sir, wishing you a very blessed new year now and for evermore! Dear, Dilip Sahab, your still being with us is so inspiring, hope the Almighty grants you a long and healthy life full of peace and joy, that you have always strived to bring the Indian community together as one family has been your greatest contribution to our nation, May the Almighty grant you and Sairaji all the bounties that is rightfully yours. WE thank you for wishing happy duaien,you are right without the suport and guidanceof graceful mother of saira bhabi ,your life would have been very lonely ,we thank saira bhabi sahiba for keeping you "PRESERVED" for fans ,wishing both of you your family happiest days in all years to come! DilipSaheb, you also maybe unknowingly unaware that you yourself maybe a source of immense admiration and awe for millions of diehard fans like myself for your strong character and courage to fight for convictions for a just cause. We strive to emulate you in our personal lives to try and remove the negative emotions engulfing us in our daily lives in the Western world.May God give you a long life and keep you in perpetual bliss and harmony. Sir, Happy new year and i wish you live for another 20 years, let's be realistic. So that you are among the very rare people left who can recall memories starting 1950s and take us back to those days. Sir,Your personality is just right for making an endorsement on the back cover of my book, A Wonderful World - Liberation and Revival 270 pages of non-fiction. Of course I would prefer to draft a foreword by you inside the book, or you may prefer to write down some experience of your life regarding the social conditions in India and Pakistan, today. I am very disappointed to see that this Blog contains extremely little about such a great actor.